Alexander Graham Bell (3 March 1847 - 2 August 1922) was an eminent scientist, inventor and innovator. Most often associated with the invention of the telephone, Bell was also called "the father of the deaf". His father, grandfather and brother had all been associated with work on elocution and speech, and both his mother and wife were deaf, profoundly influencing Bell's life's work. His research on hearing and speech further led him to experiment with hearing devices that eventually culminated in Bell being awarded the first U.S. patent for the invention of the telephone in 1876. Many other inventions marked Bell's later life including groundbreaking work in hydrofoils and aeronautics. In 1888, Alexander Graham Bell was one of the founding members of the National Geographic Society. In reflection, Bell considered his most famous invention an intrusion on his real work as a scientist and refused to have a telephone in his study. Upon Bell's death, all telephones throughout the United States "stilled their ringing for a silent minute in tribute to the man whose yearning to communicate made them possible." A Brownian tree, whose name is derived from Robert Brown via Brownian motion, is a form of computer art that was briefly popular in the 1990s, when home computers started to have sufficient power to simulate Brownian motion. Brownian trees are mathematical models of dendritic structures associated with the physical process known as diffusion-limited aggregation. A Brownian tree is built with these steps: first, a "seed" is placed somewhere on the screen. Then, a particle is placed in a random position of the screen, and moved randomly until it bumps against the seed. The particle is left there, and another particle is placed in a random position and moved, and so on. Particle color can change between iterations, giving interesting effects. At the time of their popularity (helped by a Scientific American article in the Amateur Scientist section), a common computer took hours, and even days, to generate a small tree. Today's (2003) computers can generate trees with tens of thousands of particles in a few minutes. These trees can also be grown easily in an electrodeposition cell, and are the direct result of diffusion-limited aggregation. The term cybernetics stems from the Greek Κυβερνήτης (kybernetes, steersman, governor, pilot, or rudder — the same root as government). Cybernetics is a broad field of study, but the essential goal of cybernetics is to understand and define the functions and processes of systems. Studies of this field are all ultimately means of examining different forms of systems and applying what is known to make artificial systems, such as business management, more efficient and effective. Cybernetic was defined by Norbert Wiener, in his book of that title, as the study of control and communication in the animal and the machine. Stafford Beer called it the science of effective organization and Gordon Pask extended it to include information flows "in all media" from stars to brains. It includes the study of feedback, black boxes and derived concepts such as communication and control in living organisms, machines and organizations including self-organization. Its focus is how anything (digital, mechanical or biological) processes information, reacts to information, and changes or can be changed to better accomplish the first two tasks . A more philosophical definition, suggested in 1956 by Louis Couffignal, one of the pioneers of cybernetics, characterizes cybernetics as "the art of ensuring the efficacy of action" . The most recent definition has been proposed by Louis Kauffman, President of the American Society for Cybernetics, "Cybernetics is the study of systems and processes that interact with themselves and produce themselves from themselves" . Concepts studied by cyberneticists include, but are not limited to: learning, cognition, adaption, social control, emergence, communication, efficiency, efficacy and interconnectivity. These concepts are studied by other subjects such as engineering and biology, but in cybernetics these are removed from the context of the individual organism or device. Engrams are a hypothetical means by which memory traces are stored as biophysical or biochemical change in the brain (and other neural tissue) in response to external stimuli. They are also sometimes thought of as a neuronal network or fragment of memory, sometimes using a hologram analogy to describe its action in light of results showing that memory appears to be non-localized in the brain. The existence of engrams is posited by some scientific theories to explain the persistence of memory and how memories are stored in the brain. The existence of neurologically defined engrams is not significantly disputed, though its exact mechanism and location has been a persistent focus of research for many decades. F for Fabinacci (?) sequence. Aren't lots of things in nature supposed to follow this ?.... things like pinecone patterns etc....? Gerhard Ertl is known for determining the detailed molecular mechanisms of the catalytic synthesis of ammonia over iron (Haber Bosch process) and the catalytic oxidation of carbon monoxide over palladium (catalytic converter). During his research he discovered the important phenomenon of oscillatory reactions on platinum surfaces and, using photoelectron microscopy, was able to image for the first time, the oscillating changes in surface structure and coverage that occur during reaction. He always used new observation techniques like low-energy electron diffraction (LEED) at the beginning of his career, later ultraviolet photoelectron spectroscopy (UPS) and scanning tunneling microscope (STM) yielding ground breaking results. He won the Wolf Prize in Chemistry in 1998 along with Gabor A. Somorjai of the University of California, Berkeley for "their outstanding contributions to the field of the surface science in general and for their elucidation of fundamental mechanisms of heterogeneous catalytic reactions at single crystal surface in particular." Gerhard Ertl was awarded the 2007 Nobel Prize in Chemistry for his studies of chemical processes on solid surfaces. The award, worth SEK 10 million (or 1.7 million U.S dollars) , was announced on Ertl's 71st birthday. "I am speechless," Ertl told The Associated Press from his office in Berlin. "I was not counting on this." 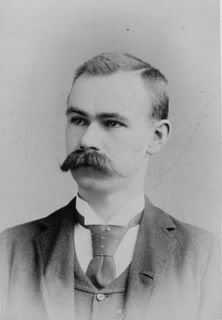 After receiving his Engineer of Mines (EM) degree at age 19, Hollerith worked on the 1880 US census, a laborious and error-prone operation that cried out for mechanization. After some initial trials with paper tape, he settled on punched cards (pioneered in the Jacquard loom) to record information, and designed special equipment -- a tabulator and sorter -- to tally the results. His designs won the competition for the 1890 US census, chosen for their ability to count combined facts. These machines reduced a ten-year job to three months (different sources give different numbers, ranging from six weeks to three years), saved the 1890 taxpayers five million dollars, and earned him an 1890 Columbia PhD¹. This was the first wholly successful information processing system to replace pen and paper. Hollerith's machines were also used for censuses in Russia, Austria, Canada, France, Norway, Puerto Rico, Cuba, and the Philippines, and again in the US census of 1900. In 1911 Hollerith's company merged with two others to form the Computing-Tabulating-Recording Company (CTR), which changed its name to International Business Machines Corporation (IBM) in 1924. The hippocampus is a part of the forebrain, located in the medial temporal lobe. It forms a part of the limbic system and plays a part in long term memory and spatial navigation. Humans and other mammals have two hippocampi, one in each side of the brain. The name derives from its curved shape in coronal sections of the brain, which resembles a seahorse (Greek: hippos = horse, kampi = curve). In Alzheimer's disease, the hippocampus is one of the first regions of the brain to suffer damage; memory problems and disorientation appear among the first symptoms. Damage to the hippocampus can also result from oxygen starvation (anoxia) and encephalitis. A lunar eclipse occurs when the Earth passes between the Moon and the Sun. A lunar eclipse may be partial or total. A partial lunar eclipse occurs when the Moon skirts into the Earth's penumbral shadow. When the Moon is fully immersed in the umbra a total lunar eclipse occurs. During a lunar eclipse, the Earth passes between the Sun and the Moon, blocking the Sun’s light. We see the Earth’s shadow creep across the surface of the Moon. Lunar eclipses are not as spectacular as Solar eclipses, when day turns to night. However, they last for much longer, and can be seen from any part of the Earth’s surface where the Moon is above the horizon. They require no equipment to view, and are perfect events for beginners to observe. Why don't we see a lunar eclipse every month? Full Moons occur when the Sun and Moon are on opposite sides of the Earth - so Lunar eclipses can only happen when the Moon is full. It would seem natural for a lunar eclipse to happen at each full Moon. But this isn't the case. The Moon's orbit is tilted by about 5 degrees to the path of the Earth's orbit around the Sun. During most months the Moon will pass above or below the Earth's shadow and no eclipse will occur. From the BBC's science site. This picture is from the full Lunar Eclipse in 3 March 07. I watched all 4 hours of it. A monkey is any member of either the New World monkeys or Old World monkeys, two of the three groupings of simian primates, the third group being the apes. There are 264 known extant species of monkey. Because of their similarity to monkeys, apes such as chimpanzees and gibbons are often called "monkeys" in informal usage, though they are not monkeys. Conversely, due to its size (up to 1 m) the Mandrill is often thought to be an ape, but it is actually an Old World monkey. Also, a few monkey species have the word "ape" in their common name. Nobel Prizes and nominations archives to be opened from 1958 this year. The mineraloid opal is amorphous SiO2·nH2O, hydrated silicon dioxide. The water content is usually between three and ten percent, but can be as high as 20%. Opal ranges from clear through white, gray, red, yellow, green, shore, blue, magenta, brown, and black. Of these hues, red and black are the most rare and dear, whereas white and green are the most common; these are a function of growth size into the red and infrared wavelengthssee precious opal. Common opal is truly amorphous, but precious opal does have a structural element. The word opal comes from the Latin opalus, by Greek òpalliòs, and is from the same root as Sanskrit upálá for "stone", originally a millstone with upárá for slab. (see Upal). Opals are also Australia's national gemstone. Quartz (from German Quarz (help·info)) is the second most common mineral in the Earth's continental crust, feldspar being the first. It is made up of a lattice of silica (SiO2) tetrahedra. 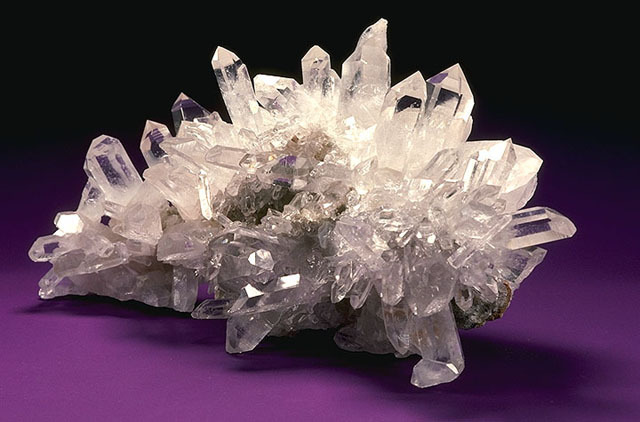 Quartz has a hardness of 7 on the Mohs scale and a density of 2.65 g/cm³.